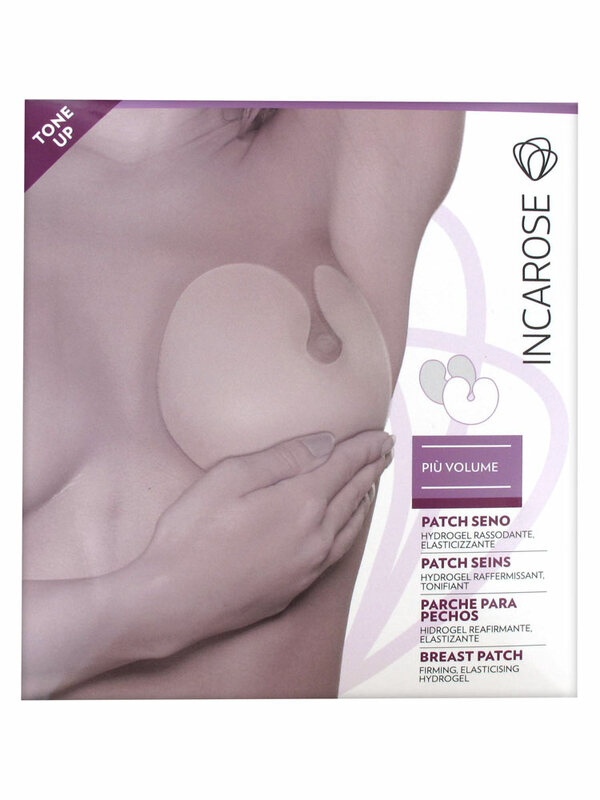 Incarose Più Volume 2 Breast Patches Firming Elasticising Hydrogel are delicate, practical and ergonomic hydrogel patches to firm and tone the breasts. The formula of these patches contains hydrolysed collagen, coenzyme Q10, aloe, argan oil, olive oil and grape seed oil, extracts of pueraria, anemarrhena and green tea offering a compact, firming, antioxidant and moisturizing activity. The breasts recover elasticity, firmness, tone and support. Apply the patch to the chest and leave for 30-40 minutes then remove. Apply at least twice a week for 4 weeks. Indication: To firm and tone the breasts. Aqua (Water), Glycerin, Sorbitol, Sodium Polyacrylate, Ricinus Communis Seed Oil, Polyacrylic Acid, Cellulose Gum, Octyldodecanol, Kaolin, Butylene Glycol, Hydrolyzed Collagen, Argania Spinosa Kernel Oil, Helianthus Annus Seed Oil, Olea Fruit Oil, Vitis Vinifera Seed Oil, Aloe Barbadensis Leaf Juice Powder, Anemarrhena Asphodeloides Root Extract, Pueraria Mirifica Root Extract, Tocopheryl Acetate, Camellia Sinensis Leaf Extract, Sodium Hyaluronate, Adenosine, Allantoin, Aluminium Hydroxide, Disodium Edta, Titanium Dioxide, Phenoxyethanol, Tartaric Acid, Peg-12 Dimethicone, Ubiquinone, Lecithin, Tocopherol, Parfum (Fragrance), Limonene, Linalool, Hydroxyisohexyl 3-Cyclohexene Carboxaldehyde.